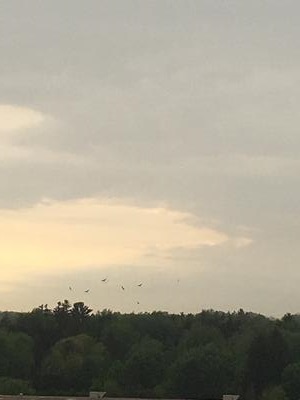 We've seen many flocks of Turkey Vultures (up to 20) gliding in the Masonville area in London Ontario on many occasions. In the attached photo the birds are seen very far away, but have been seen previously at very close range. The flock has remained in the area for around 2 years. This may be due to the natural forestry near by. When I first came to live in Southern Ontario, I had never seen Vultures before, so I'm not sure whether the population is higher now, than it was 30 years ago, but I do see them very often. I often see them in the trees near the corner of Whiteoak Road and Scotland Drive - in fact, today my husband and I observed around 15 Turkey Vultures in a tree there. I will post this on our facebook page so that our facebook followers can also enjoy this.